This simple to use drag mat helps coaches and maintenance personnel smooth out the rough spots on the infield before each practice and game. 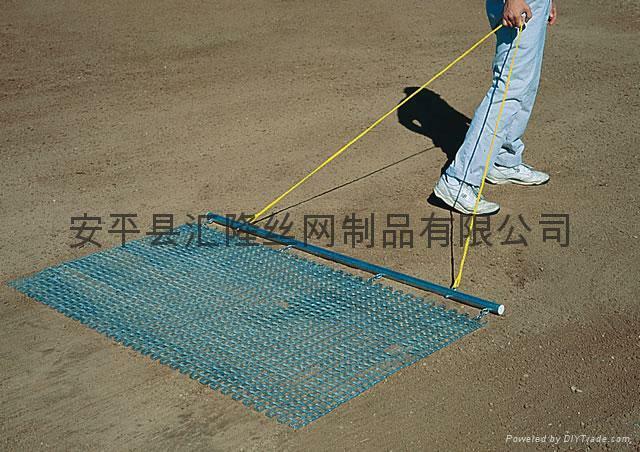 The mat has a galvanized steel construction with a 1" x 1" mesh. The front steel drag bar has an attached tow rope and can be pulled by an individual or a tractor and rolls up for easy storage and transportation. Comes completely with a nylon rope and handle attached. It is perfect for grooming and general field maintenance! Specifications︰ The drag mat has been specifically designed to meet the rigorous demands of grooming grass, shale and sand surfaces. The 11Gauge(3mm) steel, 1"(25.4mm) square mesh provides extra strength, durability and weight and maintains its shale while in us and provides extra weight to break up clumps whilst remaining easy to drag for the user. The unique clinched edge design eliminates tearing of the turf. The clinched edge allows for each rod to wrap around the picket so the edge will not snag. The patent pending rivet-free u-bar eliminates the problem of worm out rivets damaging the turf associated with worn drag mats and also makes the Drag Mat a truly reversible mat. The drag mat is supplied with both chain and rope allowing towing by ATV or by hand.